Today we are joining The Cat On My Head's Sunday Selfie blog hop. That is a great Selfie :) Have a great Easy! You must have taken that yourself...we can see your arms where they are holding the camera!! It sure does look like you took it yourself...so cute! Hi Athena! I'm Summer, the new kitty at Sparkle's blog and my new human wants to thank you for your lovely post about Sparkle. I hope I can get to know you better! Thank you. We think a Sunday Selfies Blog Hop is a wonderful idea! Thank you. Some clever editing from Mum. Hi Summer! So lovely to meet you:) Tell your human we are thinking of her and we will always remember Sparkle. We are amazed how it came out like that. Very nice selfie! I have to remember this blog hop for next Sunday. That really does look like a pic you took yourself, Athena! You have beautiful whisker humps. 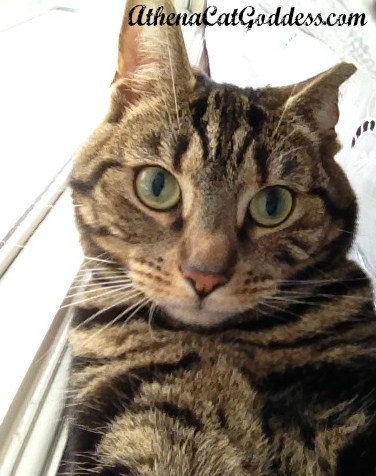 That is a purrfect selfie , Athena ! Thank you. Yes, don't forget! Thank you:) I know, my Mum keeps telling me.